After seeing it on so many bloggers (on Deena and Amy Ann among others), I've been wanting to try a blush and burgundy color combination for months. That was until I realized I actually already have with a floral top and burgundy pants and burgundy tights and blush skirt! Nevertheless I'm glad I tried it out again because I end up loving it every time. These shades can be paired together no matter the season without a Valetine-like vibe since they aren't the traditional red and pink. They can be worn in so many ways, too. What is making you feel confident today? Trying a new color combination or mixing up a color combo you've already tried? If you ever want to co-host, I would love to have you! Just email me at laura (dot) bambrick@gmail (dot) com to get a date set up. It's super easy and fun! I always want to try mixing color combos that are adventurous but end up sticking with my black, white and red combo. Perhaps I should try to venture out a little more. This blazer is so good, love this look for work. Blush and burgundy do work so well together. Love the blazer! Blush and burgundy look so good together! Your blazer is the perfect addition! I haven't paired blush and burgundy yet, but I love it! kudos for the idea! These colors look great together! And, those blush shoes with the bows are so cute! Such a chic blazer, lady! Just loving this look Laura! 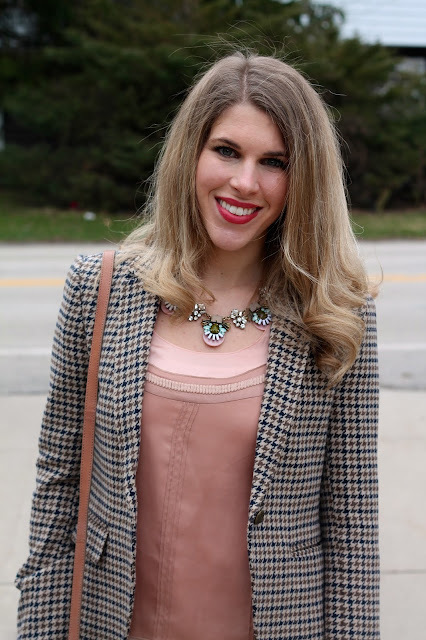 That blush blouse is so pretty underneath this chic blazer! That necklace is also the perfect touch. Love the burgundy pants & they go perfect with the blush, such a classic look! Those pieces work really well together! I've always loved cropped plaid blazers and this is Loft one is no exception - Have a lovely week! Ooooo that looks luxe! Love it, Laura! Thanks for the link up. What a nice color combination that I need to try myself. This is one of my favorite looks ever on you! Perfectly done! I really like blush and burgundy together, this outfit looks great on you! It's different, flattering, and perfect for work! I love the burgundy + blush combination and this look combines the two perfectly! I love how the blazer ties everything together too--gorgeous!! I love the top you have on under your blazer! It is so unique! I love pairing blush and burgundy together! Love this look, and such a great blazer! This is such a luxe look! That blazer was a great find! Great look! I love the blazer! It looks so versatile! love the blazer! so professional but the top makes it feminine. Blush and burgundy have been on my to wear list, as well. This looks fantastic and I am really liking that blazer and how it ties the colors together even more! I love blush and burgundy together and that top is beautiful! It adds a feminine touch to the blazer! I do like a this combo together too. I have yet to find a blush top that I like...perhaps I am not shopping enough, hehe. I am in love with this look on you! It's soft, romantic, feminine, has tons of detail but isn't overwhelming. Plus those velvet pants! Swoon. Love these soft tones. Such a great color combo, especially on you! Never thought to pair pink and maroon together. Love those burgundy pants! The texture really makes the outfit pop! Oh wow, I think this is one of my favourite outfits on you! I love that blazer paired with the burgundy pants! Blush and burgundy look great for this time of year. Love this look! Such a great business casual and chic look! You look beautiful! I love this colour combination! And I love how you paired it with the blazer and that necklace. This is a gorgeous outfit! Love this look! Especially those gorgeous ballet flats! Those are super cute! Lovely combination on you. You can't go wrong with a great blazer and the necklace you've paired with it is gorgeous. Really pretty color combination! I don't think I own any burgundy, actually. I'll have to check! I know the popular name for pink this spring is rose quartz but when I see your flirty, feminine pink top, I envision all things ballet. I have the burgundy pants but desperately covet that top and while I am at it, those shoes. Gorgy! How polished you look Laura. The blazer and flats are classy. I e-mailed you about co-hosting about a month ago but haven't heard back from you.